The beer scene in Melbourne's west has been coming into its own in some style in the past few years. Two of the more recent additions are Hop Nation, the brewery opened by a pair of winemakers, and Up In Smoke, a venue combining craft beer with smoked meats. 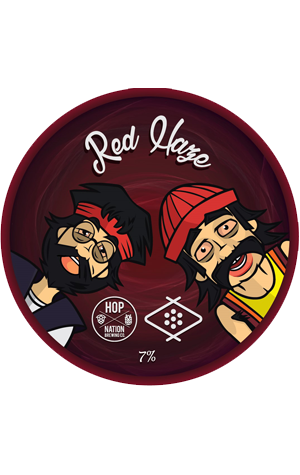 And now the two have come together to create Red Haze, a beer that combines their two passions (and names): hops and smoke (and smoked malt for good measure). Sam and Dunc from Hop Nation took some ingredients along to Up In Smoke's kitchen. Crystal malt was hot smoked for use in the mash, while Riwaka hop flowers were cold smoked (as heat would have affected the compounds that lend beers much of their hoppy goodness). The picture was completed with the addition of some dry hopping with US hop Simcoe to add some pine and resin to the mix. According to Dunc, aside from the hops Red Haze has "a chewy, malty backbone full of toffee with a nice sweetness" with the aim being "to produce a beer that;s not too smokey – just subtle hints." Read our Crafty Crawl through Melbourne's West here.